Duncan Ridgley is a traveller and a host. He is also an internet entrepreneur. He left the UK in 2004 with his young family to work out a way of making a living so they could keep travelling. The result was Somewhere Different. He wrote a book about his travellers. It’s in kindle and paper back and you can buy a copy of it here. It’s called Somewhere Different. 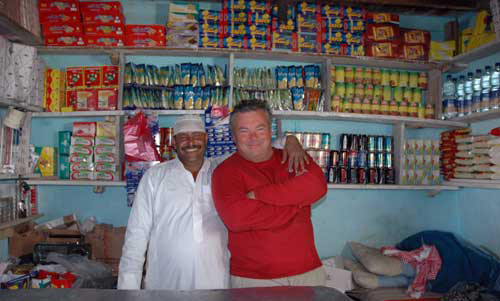 Along the way, Duncan saw there was a need for finding specialist building skills to help construct his hotels in Egypt and Transylvania; as well as a teacher to homeschool his kids. He talked to lots of travellers who had all kinds of skills looking for work and the concept for Working Traveller was born.
. Duncan did six months of working and travelling using WT in the winter of 2016 in India You can see the video diary he kept here titled Work and Travel in India. He is currently in the Ukraine where he is working from co working places as a digital nomad on the web site. You can follow his adventures on his personal IG by clicking on the logo below.